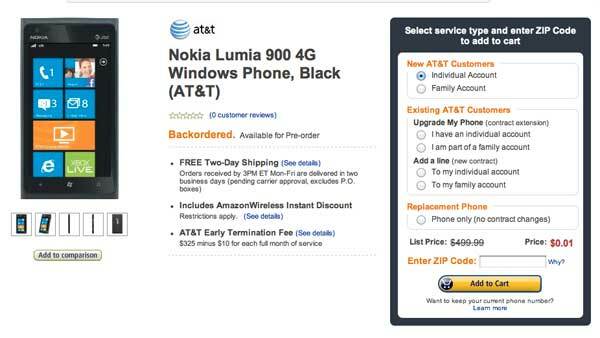 AT&T has started taking Nokia Lumia 900 preorders at the low price of $99.99, with the requisite 2-year contract agreement. When phones are released, we often see third-party online retailers offering deep discounts, but it seems a few have jumped the gun offering preorder deals. Walmart is offering the Lumia 900 for $49.99 and Amazon Wireless goes even lower, with a price of just $0.01. Yes, it’s only a penny. Both Cyan and Black are available through Amazon Wireless. Walmart offers only the cyan version.